Antony Gross was born in Dulwich, London in 1905, the son of a Hungarian map-maker and Anglo-Irish-Italian suffragette. He was educated at Repton School, Derbyshire, but left in 1922 due to his father’s bankruptcy and parents’ separation. In 1923, he trained at the Slade School of Fine Art as a pupil of Professor Henry Tonks, continuing his studies at the Central School of Arts and Crafts, at the Academie Julian and the Ecole des Beaux-Arts in Paris. In April 1924, he moved to Madrid to study at the Academia de San Fernando and in November 1925 held his first one-man show of oil and watercolour paintings and etchings at London’s Abbey Gallery, Victoria Street. He returned to the Academie Julian in October 1925 to attend life classes and to specialise as an engraver. Gross then travelled to paint and etch in Spain – finding time to participate in a bullfight - North Africa and Italy. In 1928, after an unsatisfactory period painting in Brussels, he returned to Paris. He etched in Brive (in the Correze), Cahors and Toulouse, where he refined his printmaking skills. At this time, he developed a close working association with the leading engravers SW Hayter and Joseph Hecht. During 1929, Gross produced several oil paintings in St Tropez, Brive and Paris and the following year married Marcelle Marguerite (Daisy) Florenty, a fashion artist from Villeneuve. From 1930-1931, Anthony Gross completed a series of prints and paintings – Sortie Usine and La Zone – depicting factory workers in the Paris industrial suburbs. In 1931-1933, he exhibited a series of oil and watercolour paintings in Paris galleries, designed sets and contemporary ballet costumes and collaborated on several animated films with American photographer Courtland (Hector) Hoppin and Hungarian composer Tibor Harsanyi. These included drawings for the hugely popular cartoon film La Joie de Vivre (1934) and The Storm. Gross also became a Member of La Jeune Gravure Contemporaine (founded 1929), a Paris-based printmakers society, for whom he would exhibit for the rest of his career. In 1934, after the success of La Joie de Vivre, Gross exhibited at the Leicester Gallery and was contracted to Alexander Korda’s London Films. He moved to London for the next three years, producing line drawings and etchings from his Chelsea studio and working on the colour animated film Fox Hunt (1936) and The Nativity. He also illustrated a special edition of writer Jean Cocteau’s 1929 novel Les Enfants Terribles. Although his celluloid animations were well-received - he was appointed Art Director for London Films in 1936 - he became dissatisfied with the film business and returned to Paris in 1937. Once more in his Paris studio, he worked on several new animated films, including an (unfinished) version of Jules Verne’s Around the World in Eighty Days, until the outbreak of war in September 1939 forced his return to London. In March 1940 – after a letter of recommendation from fellow artist Eric Kennington – the War Artists' Advisory Committee (WAAC) gave him a brief to etch training activity at the Guards Barracks, Caterham and the Auxiliary Training Service (ATS) depots at Camberley and Shoeburyness. The success of this first commission, coupled with Gross’s outgoing personality and sense of adventure, propelled him into a prolific career as a war artist across several theatres of war. As London prepared for mass air attack, Gross received a new commission to paint watercolours of the capital’s defences and worked on an abortive film project, The Ballad of Barrage Balloons. In July 1940, after returning to France to bring his family out and moving them to Flamstead, Hertfordshire, Gross was appointed by WAAC as a salaried war artist and selected for further projects by the War Office. At the height of invasion fears in the summer and early autumn of 1940, Gross painted several coastal defence scenes on the English south coast. 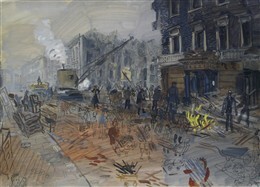 During late 1940 and throughout 1941 he painted 98 sketches, watercolour and oil paintings on home front themes such as the Blitz, including Collecting Firewood (1940-1941). Gross was commissioned as a temporary captain in late 1941 and volunteered to cover subjects in the Middle East. He embarked by troopship for Egypt via South Africa, en route completing his Convoy painting series. Arriving at Cairo in 1942, Gross was attached to the 9th Army and travelled with the British Druze Regiment and the Arab Legion to record scenes in Palestine, Syria, Lebanon, Kurdistan and Mesopotamia. He was accompanied on several of these excursions by fellow official war artists and friends Edward Bawden and Edward Ardizzone. Gross recalled later how the sights and sounds of the Middle East – Syria most of all – appealed deeply to his artistic instincts. After travelling with Free French units across Syria, he painted Fighting French Marines on the Mina (1942) and Desert Patrol (1942). Back in Cairo – after a sojourn at the Romanian legation in Tehran, Persia and sharing a studio with Edward Ardizzone - Gross produced a series of paintings on the British 8th Army’s desert operations – Battle of Egypt - in the run-up to its victory against the German Afrika Korps in the Battle of El-Alamein of 1942. In July 1942, Gross made sketches at a series of British medical bases in the Western Desert, painting British forces in action at El-Alamein and the casualties which returned. In 1943, Gross was sent to India and then on to Burma, travelling up river by sampan to the British front lines in the Arakan region and producing his Battle of Arakan series. He depicted several scenes of British and Indian troops close to Japanese positions at Dombaik and personally experienced air attack by a Japanese fighter. After painting local tribesmen in the Chin Hills for a Chins at War series, Gross was recalled to Tunis and then back to Europe. On his arrival in London he held a one man show at the National Gallery entitled: India in Action. Gross returned in time to accompany the D-Day Landings in Normandy on 6 June 1944, wading ashore on Gold Beach at Arromanches holding his sketchbooks and canvasses above his head. Together again with fellow artist Edward Ardizzone, Gross stayed in the invasion beachhead area for the rest of June, painting the arrival of thousands of allied troops and their equipment and the ruins of Caen and Bayeux. He then followed the allied armies as they entered Paris, painting his Liberation and Battle of France series (of Free French Forces and the French Resistance) and on into Germany, producing his Gateways into Germany series. He was one of several war artists to paint General Bernard Montgomery’s portrait during the British Army’s advance across North Western Europe. He recalled this as a testy encounter. On 26 April 1945, he painted the historic East/West meeting of advancing Soviet and American forces at Torgau on the River Elbe, signifying the effective military division of Nazi Germany. After completing an estimated 500 paintings and drawings during 1939-1945, Gross’s eventful service as an official war artist came to a close. He picked up his pre-war career in London, working in Chelsea from 1945-1959 and subsequently in studios in Blackheath and Greenwich Park. From the mid-1950s he divided his year between London and Le Boulve in France. He illustrated editions of Bronte’s Wuthering Heights (1947-1948), Galsworthy’s The Forsyte Saga for Heinemann press (1950) and produced colour lithographs for Lyons Restaurants. During 1948-1954, he taught life drawing at the Central School at Arts and Crafts (today’s Central St Martins College of Art and Design) and from 1955-1971 was Head of Department (Etching and Engraving) at the Slade School of Fine Art. He held a one man show of his war paintings at the Imperial War Museum in 1954 and exhibited further in London, New York and Paris. Gross was elected Associate of the Royal Academy (ARA) in 1979, RA in 1980, Senior RA in 1981 and received an OBE in 1982. He was a Member of the London Group (of artists) from 1948-1971, President of the Printmakers’ Council (1965), Visiting Professor at the Minneapolis School of Art, USA (1965-1966) and an Honorary Member of the Royal Society of Painter-Etchers and Engravers. A retrospective exhibition of his work was held at the Victoria and Albert Museum in 1968. He published Etching, Engraving and Intaglio Painting (1970) and, after retiring to France, The Very Rich Hours of Le Boulve (1980). By the time his career ended in the early 1980s, he had produced thousands of line drawings, hundreds of watercolour and oil paintings, animations, book illustrations and 360 copperplate engravings and etchings. Today, some 300 of his artworks are held in the collections of the Imperial War Museum (IWM). Anthony Gross died at Le Boulve in 1984. In 1995 the Redfern Gallery, London, held a further retrospective: Anthony Gross RA 1905-1984, An Exhibition of Prints 1928-1984. This page was added by Ronan Thomas on 18/11/2010.